The CPG world has changed, yet from a trade planning perspective, most are stuck in the “TPM Matrix” following the same approach to seek improvement in trade effectiveness. 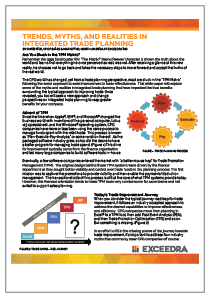 This white paper will explore some of the myths and realities in integrated trade planning that have impacted the true benefits surrounding the typical approach to improving trade. Once revealed, you too will seek a new approach and change perspectives on integrated trade planning to reap greater benefits for your company.